You may buy it from any on-line or physical book store in your territory. In starting of this blog I start registered copy of my books for maintain a record of my followers but now I hear that If I registered copies of my book then I am also liable for any mistake of book seller like Amazon, Flipkart, BookAdda etc So I close all new registration and now I do not registered by books buyer data with me. I try my best to reply your question but due to lot of e mails It is not possible to reply all of e mails and I do not give my contact number to my blog follower's because I have lot of work and unable to talk with all of my followers word-wide, so please try to understand my situation and do not force to me to give my mobile number. Well am a regular reader or follower of your blog. 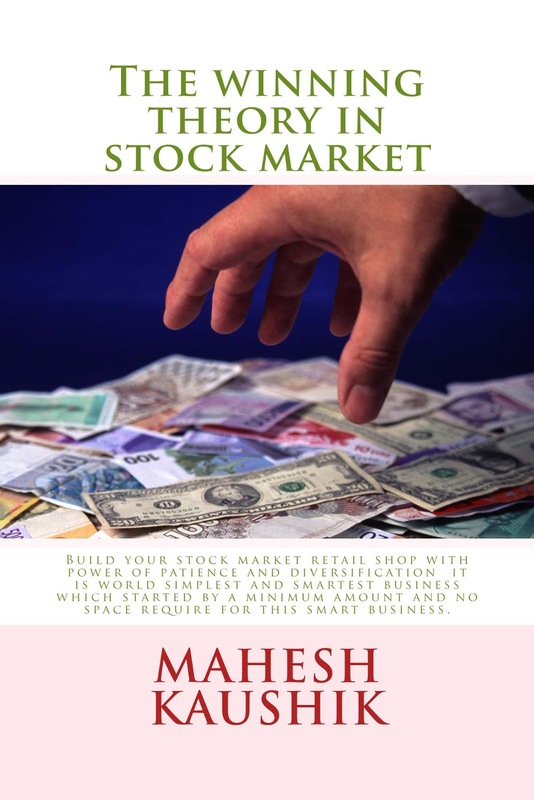 Thanks for writing a book on STOCK MARKET, even though i have bought book through bookadda.com. I have not registered in your blog. About your book.. I eagerly waited for your book when I booked it, after reading it, It didn’t meet my expectation. SORRY to say this. Its not so worth to BUY it. I had gone through it well, Each and every chapter I felt very bad. There was no Logic in how to be discipline in Share Market. Apart from your 1st chapter about Retail Business. I didn’t find any other chapter worth it. Gaining 15% profit is worth than Losing money by been greedy in the stock market. About your Chapter 10 “REVERSE TRADING SYSTEM”. Please go through the chapter Once Again. I don’t know how YOU can make mistake in the Calculation. Yes what you said is right PSYCHOLOGICAL EFFECT which has made you think that you have gained or recovered the money you have lost it. BUT actually you have lost it and minimized the lose but not gained or recovered money you have lost. About your 2nd Chapter . HOW TO MAKE $71803722 BY $100 INITIAL INVESTMENT IN STOCK MARKET. The idea which you have provided in this chapter, there was no LOGIC in it. I felt very bad for this. Last but not Least. I don’t like giving false feedback. I found lots of review in your blog. I think either they have no knowledge of about share market or they have not read the book properly and understood it. Please do not think wrongly, what ever I have said it is because am also a small Investor with a Little big Dream. Even though I am still following your blog regularly for your Updates on stocks. I was the one who recommended your book for many of my friends before purchasing it. Later couldn’t recommend your book to anyone. I am still waiting for your next book to be released but with extra expectation. i buy this book and found it very very usefull and worthy i think you are a short trader or a newbie who do not knew about market so first understand the way of value investing than comment about this world no 1 book on stock market. I am sorry to know that you are not like my book and find it disappointing and useless. Here is my explanation about your negative but well-wisher comment. 2. Your next querry about my book chapter no 10 that in my reverse trade of punj lloyed i think that i have gained or recovered the money which i have lost it. BUT actually i have lost it and minimized the lose but not gained or recovered money you have lost. 3. About my 2nd Chapter . HOW TO MAKE $71803722 BY $100 INITIAL INVESTMENT IN STOCK MARKET. 4. You wrote my followers and book reviewers have no knowledge about market , sorry sunil but this type of comments for other reviewers is bad manners. 6. However I suggest you please forget my book for next 2 year when you earn some experience in this market than you automatic realize the concepts given in this book. How to follow you? Is there face book address? I ordered for THE WINNING THEORY IN STOCK MARKET and waiting for the same. Is any thing from your book in Hindi available? Hindi Translation of the winning theory is under progress .. i will update all of followers when it complete. Please tell us how to calculate the raito. As you mentioned in punj lloyad first 2 then waiting for stable 1.5. In book its not mentioned in any chapter. Your book is quite worth for newbie. I liked its simple and understable analysis, even newbie can done easily. I have some queries about Base price as after reading the book. 1. If base price is less than 20% CMP then buy. It is ok.
2. If base price is more than 20% CMP then dnt buy. It is ok. So how we can consider in point 2 and 3 its ‘dnt buy’ or ‘Value Buy’. Can you reference how to predict the best price to buy after seeing all fundamentals according to book. "If a stock just crosses his base price in upside and traded 10-20 % higher from the base price than I think buying price is a value buy but in opposite stock cross his base price in downside than it is risky to buy. " It mean if stock price is up from his lower price to higher price and traded 10% above base price but still not cross 20% upside from base price then it is a value buy, but if it cross 20% upside from base price then we do not buy it because valuation of this stock is already higher from base price , visit my website www.maheshkaushik.com for seeing practical examples of fundamental stocks.